Many Americans are unwilling to pay for advice on their retirement planning. I believe it is the result of finding objective advice without the pressure of buyng a product. People should sek the advice of a fiduciary adviser, someone who provides advice with the best interest of the client first and foremost. Three-fourths of middle-class Americans say their estimate of what they’ll need to live on in retirement is based on “some sort of guess,” a new survey finds.And those guesses often appear off the mark, according to the annual Wells Fargo Retirement Survey. For instance, middle-class Americans say they believe the median cost of their out-of-pocket health care costs in retirement will be $47,000. But the Center for Retirement Research estimates a typical couple at age 65 can expect to spend $260,000 or more over the rest of their lives. Further, when asked what percentage of their nest egg they expect to withdraw annually in retirement, the median — or typical — withdrawal predicted by middle-class Americans is 10 percent. But most experts recommend annual withdrawals of 3 to 4 percent. In addition, middle-class Americans say they’ll need a median of $300,000 to support themselves in retirement — but to date have saved only $25,000. The survey also found that 34 percent of middle-class Americans estimate that their retirement income will be half their current annual income, or less. The median household income for Americans was roughly $50,000 last year, so that means many are planning on living on $25,000. “Clearly, the guessing doesn’t work,” said Laurie Nordquist, a director of institutional retirement and trust services at Wells Fargo. The survey findings suggest that many consumers are too focused on paying day-to-day bills to spend more time on retirement planning, she said, even though that’s clearly warranted. Harris Interactive Inc. conducted the telephone survey of 1,000 middle-class adults from July 9 through Sept. 12. To aim at the middle class, participants fell within specified income and wealth brackets. For example, those between the ages of 30 and 75 had 2011 household income of $50,000 to $99,999, and assets of $25,000 to $99,999 that could be invested. 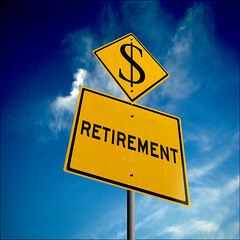 Have you done detailed calculations of your financial needs in retirement, or are you, too, playing the guessing game? Many will guess on their retirement needs. Yet these same people will go to a doctor for a checkup or will not guess on their taxes. They will seek the best advice available. Retirement planning is far too important to guess your needs. Are you young and scared to invest?